Unique rentals offer lodging where marijuana consumption is encouraged. 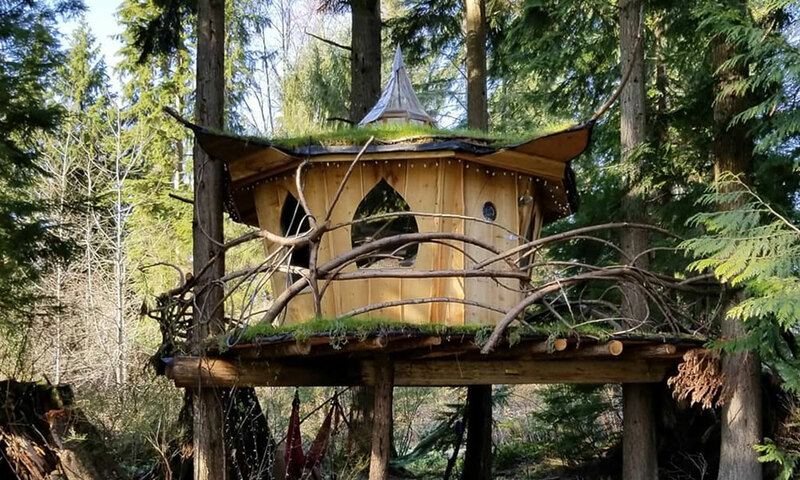 At a time when cannabis is coming out of the woodwork, Tracy Rice is bringing it back to the woods with her cannabis friendly tree houses, located in the lush Pacific Northwest forest near Monroe, Washington. Rice started this venture after being a successful medical marijuana dispensary owner in Colorado during the early 2000s. She then sold her business and moved far west, Northwest, to start yet another venture driven by he/r gypsy lovin’ soul. While visitors can’t purchase cannabis on site, they are encouraged to enjoy it on the property. Upon arrival at Mountain Views Tree House Joint, visitors will feel transformed into a magical forest oasis. The space consists of a main house, in which Rice lives and hosts guests who want a more homey feeling, with two rooms available: The Yellow Sunshine and The Green Tree. Those desiring a more unique stay can opt to rent one of the three tree houses on the other side of her property. Rice’s bright personality and contagious smile has guests feeling high and mighty before lighting up or even stepping foot inside any of the high rises. When commonly asked where her guests can toke up on the property, her answer is “anywhere and everywhere!” There are no rules when it comes to smoking weed in these tree houses, except please do it and don’t ask for permission. The tallest tree house, and Rice’s favorite, the Hashtag Treehouse, can sleep three comfortably and is 11 feet off the ground, proving to be a great place to stay even for the tallest of guests, as it comes with very high ceilings. The Pot Leaf Tree House was the second treehouse structure that was built and features a wrap around deck with 360-degree views from the space to the outdoor arena. With a nonagon shape the nine-sided tree house, mimicking an indica leaf, includes a 108 square foot room that feels much more spacious inside and is fully stocked with essentials for cooking meals and making morning coffee, plus lounging in comfort with an ultra soft rug under your toes. The cozy spaces to kick it, whether underneath the skylight in bed, or underneath the tree house in the huge hammock, are the many perks of this tree house. The 420 Treehouse comes with a breakfast bar (or joint rolling station if you prefer) with gorgeous views to keep you wanting to stay and smoke joint after joint as you watch the night sky color change. TELL US, would you stay in a 420 friendly tree house?